The Data Management assets include the items needed to gather data for actions and asserts. 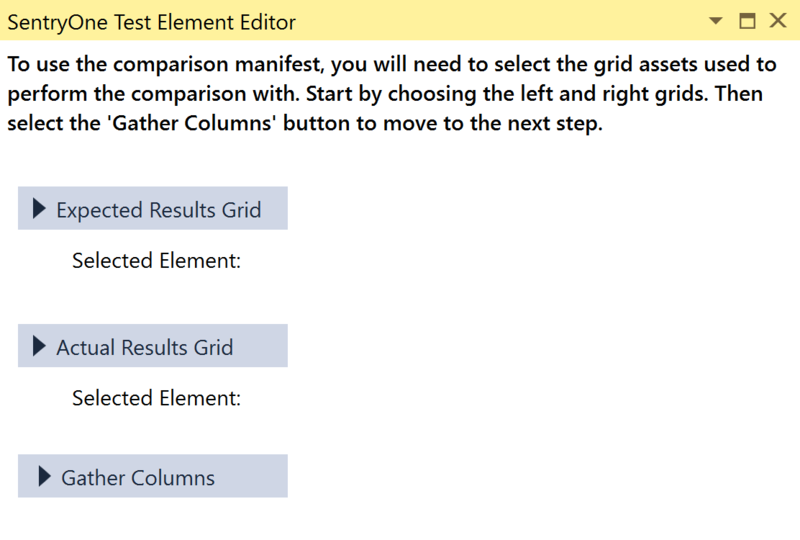 The Comparison Manifest asset is used in the grid comparison assert. This asset defines how the two grids in the assert compare to each other. First the you need to gather the left side of the comparison, then the right. Once both sides of the comparison have been gathered, you may set which columns to compare and how to compare them. Expected Results Grid Select the grid you wish to be the left side of the comparison. Actual Results Grid Select the grid you wish to be the right side of the comparison. Gather Columns Select Gather Columns to proceed through the Comparison Manifest. Connection The location of the data you want to compare. The connection can be set from an existing connection asset or typed into the connection string box. 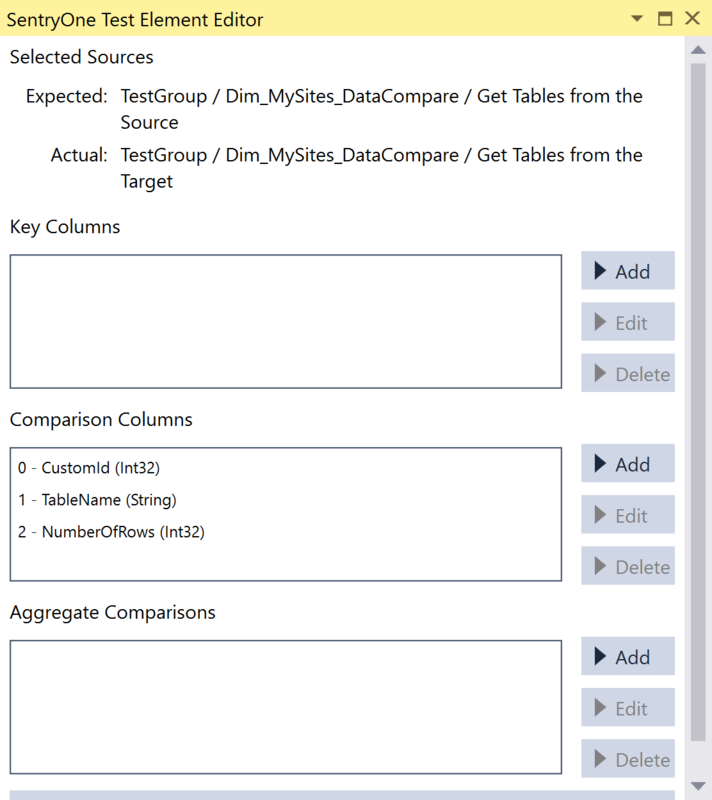 Query The query you want to use to gather the data you want to compare. This can be typed in the editor box, or pulled from an existing query asset. Key Columns Add, edit, or delete the key columns from each side of the comparison. Select the left and right column that match as the key column, and specify if the key is descending. Comparison Columns Set the columns you want to compare. Columns with the same name and data type automatically populate to compare. 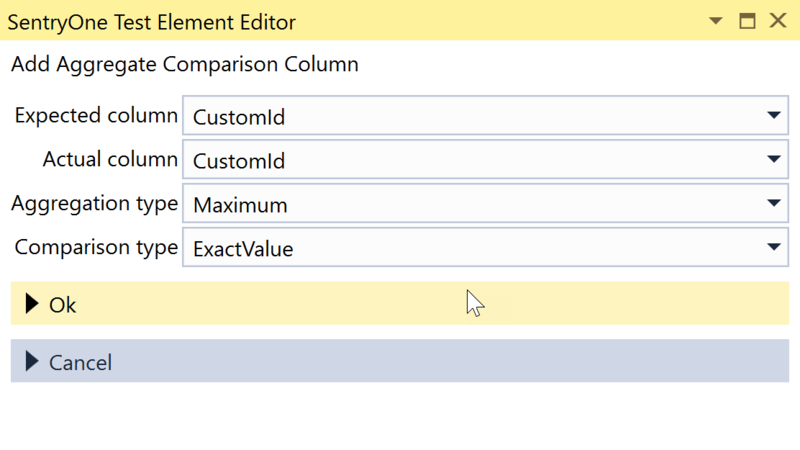 In the key columns, choose a comparison type based on the type of the column. Integers have fixed tolerance options, and strings have an exact value option or a string match option with additional parameters. Aggregate Comparisons Set aggregate comparison of columns. There are several aggregation types to choose from depending on the types being compared, as well as standard choices for comparison types. The ADO.NET Connection asset creates and stores a connection string to a data source. If you know the connection string, you can simply type it into the Connection string field, otherwise you can use the connection string builder. Provider The provider type for the connection string. Connection String The connection string for the data source. Configure Launches the connection string builder, and walks the you through creating the connection string that's stored in the asset. Data Source This is the provider type specified in the element's editor. Server Name The name of the server where the data source is located. Log on to the server Use window's authentication or provide a specific user name and password. 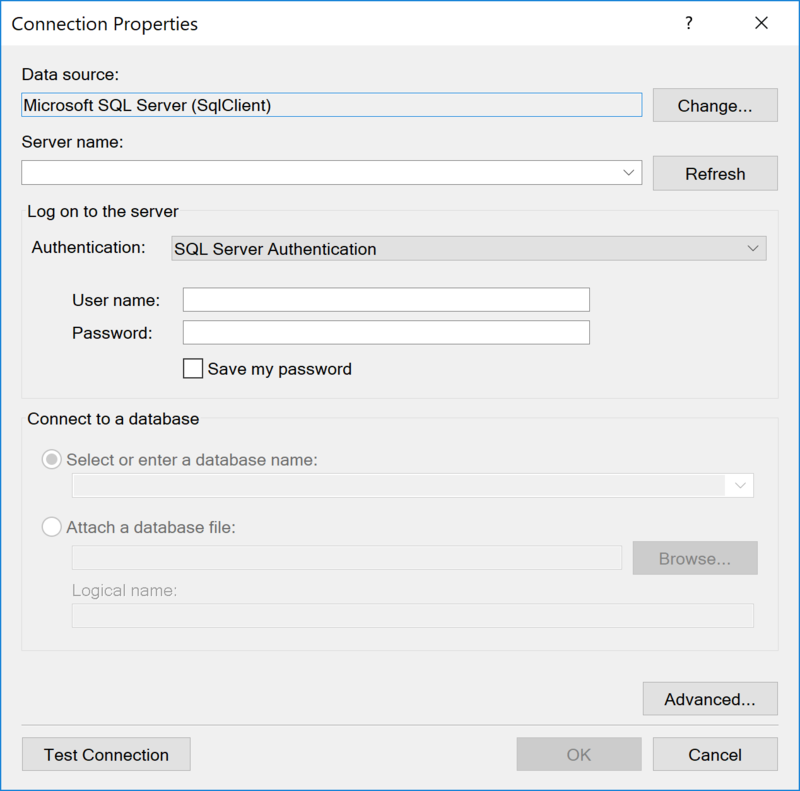 Connect to a database Select a database located on the server specified, or attach a database file. Note: Once all items are populated you can select Test Connection to ensure that everything connects as expected. The connection populates the connection string based on the properties provided in the element's editor. The Data Generation Solution asset picks an existing data generation solution that was created in Pragmatic Workbench, and is later executed with the Data Generation action. Load Solution Select Load solution to open the file picker window. Browse for an existing .dgsln file and load it into the asset. Once loaded, the editor informs you about the number of tables affected. The Delimited Content asset stores some delimited data that becomes part of the test assembly. This enables, for example, an easy set up for static data as a data driven testing source. File content Type the data that you would like to store in the test assembly. This data stores in asset files and can be in any delimited format. Delimiter / Quote These are the delimiter and quote that the file has. The asset's format detection routine always checks tab, pipe and comma for delimiters and both single and double quotes for the quote. If your file uses a different delimiter or quote, you can enter them here. Detect format Begins the process of detecting the format of the file and columns. Format This lists the formats that have been evaluated, along with their scores. A higher score indicates better compliance (consistent number of columns across rows and a higher number of columns in total). The format with the highest score is pre-selected; unless a custom delimiter or quote was specified, in which case the custom format is pre-selected. Note: The format selection is only available immediately after running the format detection process. When coming back to edit the asset later, this option disappears. Delimiter / Quote Shows the currently selected delimiter and quote. Lines to skip The number of lines of pre-amble to skip. Has header row Select this if the file has a header row containing column names. The header row comes after any pre-amble. Treat empty as NULL Select this if empty values should be rendered as <NULL> values. Encoding the encoding that's used to read the file. If your file contains special characters that are represented incorrectly on preview, it's likely that the encoding needs changing. Culture This is the culture that's used to interpret the source data as typed values. Decimal points and date formats are those where the culture requires particular attention. Preview Data Displays the preview of the data using the selected option in a grid view. The Delimited File Reference asset selects a delimited file and gathers information about both its format and the data it contains. File name Paste the file name here or use the ellipsis button to select a file. A parameterized value may be used in the form %parameterName% or . Lines to skip This is the number of rows of pre-amble to skip. Auto automatically finds out how much pre-amble there is. Note: Header rows are automatically detected. Lines to scan This is the number of lines of data to scan while detecting column formats. Format This lists the formats that have been evaluated, along with their scores. A higher score indicates better compliance (consistent number of columns across rows and a higher number of columns in total). The format with the highest score is pre-selected unless a custom delimiter or quote was specified, in which case the custom format is pre-selected. Note: The format selection is only available immediately after running the format detection process. When coming back to edit the asset later, this option disappears. Has header row Select this is the file has a header row containing column names. The header row comes after any pre-amble. Culture The culture that's used to interpret the source data as typed values. Decimal points and date formats are those where the culture requires particular attention. Change delimiters Change the custom delimiters and run the format detection again. Column list Each column is presented along with a list of types. This list is derived by attempting format conversion on a variety of formats. You can change the resulting type to any of the allowable formats. Stores an excel file as a connection asset. File Name The name of the excel file that's used for the asset connection. Sheet name, range reference, or named range name The name of the excel sheet that's used for the asset connection. Start from row Select the row where the asset starts the count. Has Header row Select whether the first row is recognized as the header row. Detect Format Begins the process of detecting the format of the columns. The name of the excel sheet that's used for the asset connection. Preview Data Preview the selected data in the asset. The Fixed Width File Reference asset references a fixed width file and, after specifying the column widths, determines the format data each column represents. Lines to scan The number of lines of data to scan while detecting column formats. This is a file where the last column is not fixed width, with each line terminated by a carriage return and/or line feed. A line is parsed if it's at least as long as the sum of the widths of all but the last column. This is a file where lines terminated by a carriage return and/or line feed. A line is parsed if it's at least as long as the sum of the widths of all columns. This is a file where there are no line breaks, and the data comes in a continuous stream. Every x characters are parsed where x is the sum of the widths of all columns. Columns This is the list of column widths that is parsed from the file. You can use the + and - buttons to add or remove columns to/from the end of the list. Alternatively, you can place the caret in the first column width box, type the width and then press enter. This adds a new column where you can repeat the same process. Note: Pressing enter in a width box only adds a new column if you are currently in the last box. Pressing enter on any other boxes moves focus to the next box. The Grid Collection asset stores the details of a grid that can be used over and over using the Load Grid from Asset action. Supply a connection string and a query that pulls the information for the grid. Both the connection and the query can be typed or pulled from another asset. Connection Connection string to the data source, can either be typed manually or pulled from an existing connection asset. 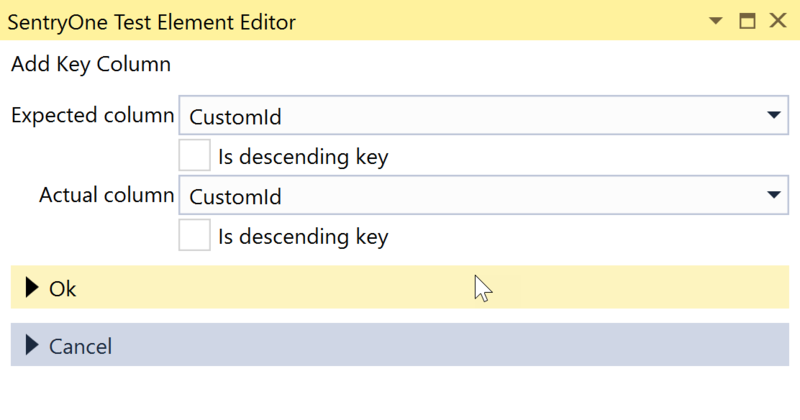 Copy From Asset Copy the connection string data from the connection asset. Connection String Connection string to the data source, can either be typed manually or pulled from an existing connection asset. Low memory mode Toggles whether the grid is stored on disk or in memory. Is Disk Based Store the query restuls within a temporary file instead of in memory. This option is best used for larger data sets. Query The query responsible for gathering the data for the grid. The Query asset stores queries. 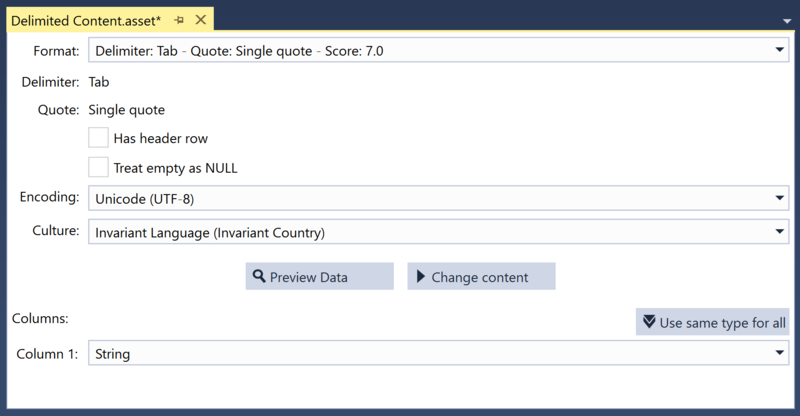 When connecting to a SQL Server or Azure SQL instance, the query editor includes an advanced editing experience. You can select the connection from the drop-down at the top of the editor, which loads information about the schema of the database where the query runs. The selection is remembered for the duration of the session. Code completion Suggestion lists after . or when Ctrl+Space is pressed. Quick info Hover over an object name for information about that object. 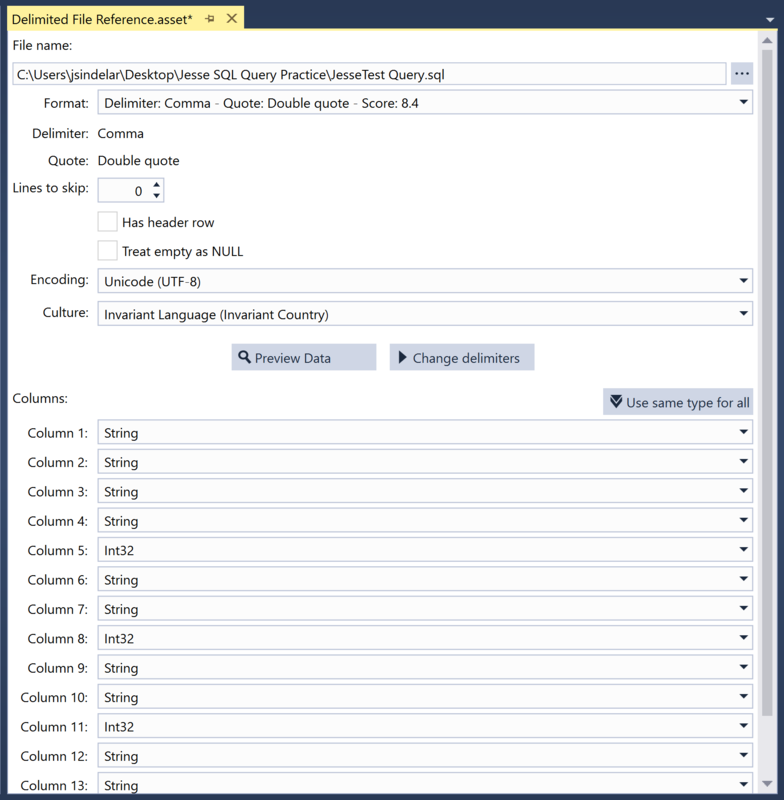 Refactoring Tracked renaming of variables and temporary objects, query formatting, object qualification. Parameter information Shows the parameters expected for procedure and function calls. Column choosers Select table that you want to resolve an ambiguous column. Synonym resolution Work with synonyms with the full IntelliSense experience. Shortcuts e.g. 'ssf' -> 'SELECT * FROM', st100 -> 'SELECT TOP 100 * FROM'. Tab expansion Select tab when the caret is to the right of a * to specify all columns. Note: A summary of the available functions can be found by selecting the ? icon in the bottom right hand corner of the editor. The Validation Manifest selects a grid, and then add rules to validate the content of the grid. There are different available rules for any given type available in the grid. Select Grid When the editor first opens, the only available option is the Select Grid button which displays all available grids in the test to validate. 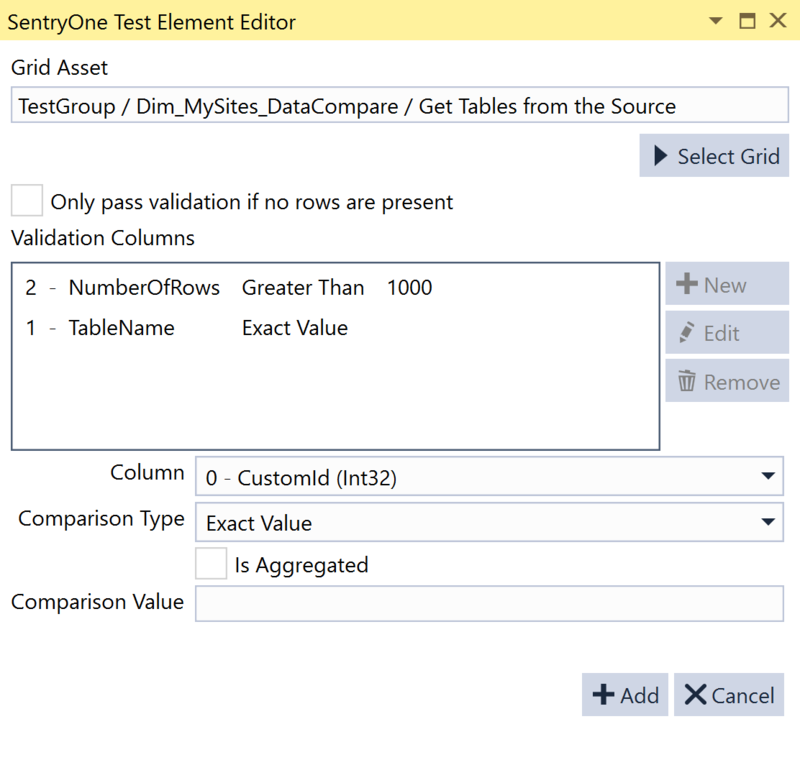 Once a grid is selected, then the ability to add validation columns will be available. Note: If you want to validate the fact that the grid is empty (for example, because your query only returns rows that fail) you can select the Only pass validation if no rows are present option. Remove Deletes the selected rule from the manifest. New Expands the editor to show the column selector and comparison type picker. Column Selects a column from the grid to apply the comparison. Comparison Type The available comparison types vary depending on the type of the selected column. 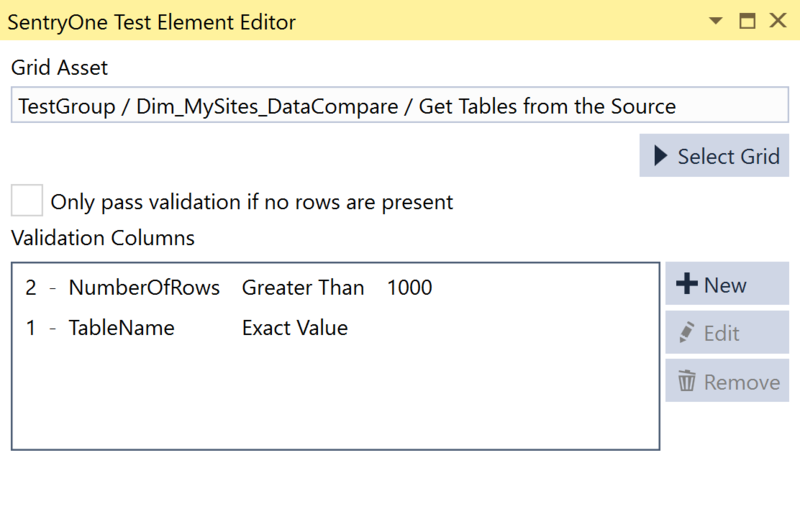 The comparison type uses the Comparison Value field to execute the validation. Is Aggregated If selected, and the column's type allows for aggregation, then another field allows you to select the type of aggregation. Comparison Value The comparison value is compared to the row of each column using the previoulsy selected Comparison Type. Cancel Cancels out of the new comparison without saving. Add Enables once all fields are populated for the new rule and saves the rule to the Validation Manifest.